It’s been a while since I’ve had time to sit down and write, but here we go. 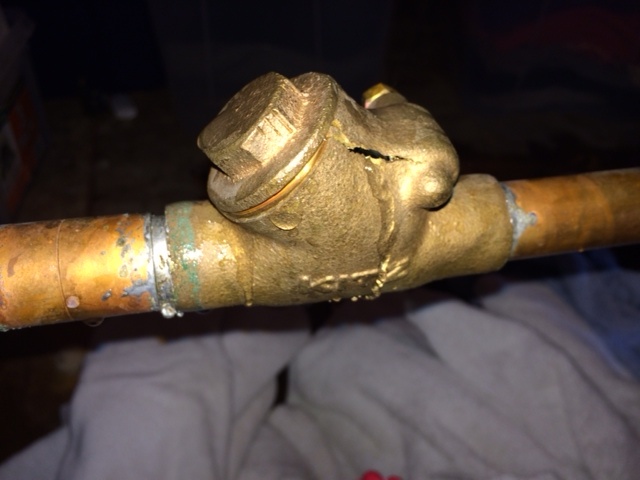 In the picture below you can see a crack in the copper which caused this client to have water pour out and flood in area of their home. Just because one person has a cracked pipe doesn’t mean it has to happen to everybody. Now, don’t get me wrong problems do happen with plumbing each and every day, but, if you look over your plumbing at your home, rental property or business place you can catch and reduce the chances of major water damage to occur. We have noticed that major floods happen when homeowners are gone for long periods of time including over the winter or longer weekends. So, the easy solution is to shut off your water main. No one wants to come home to a flood and major damage. After, you come back from your vacation, turn on your water and check all plumbing on the property. Turn on all faucets and let water run for a couple minutes to confirm everything is working and your back up and working. Plumbing issues can creep up unnoticed. If you happen to notice any difference to your pluming when you come back call a plumber right away. Never wait when speaking of a plumbing issue. Normally if you notice a difference something has happened and typically with plumbing the problem only worsens and sometimes quite quick. Call Hiawatha Plumbing for all your plumbing and drain cleaning related issues. We’re here every step of the way. Been servicing the city of Minneapolis and the surrounding suburbs for over sixty fie years.